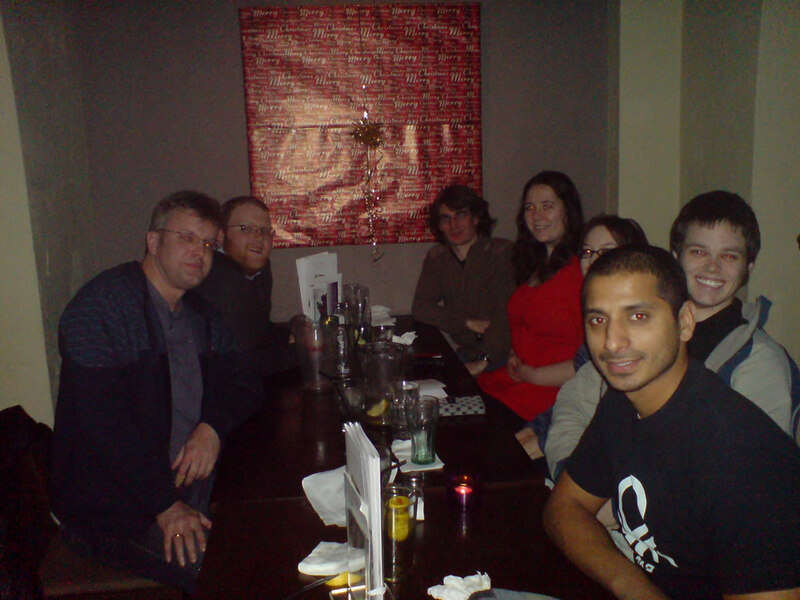 Thursday saw us head down to the Slug & Lettuce on Park Row for the Atheist Society Winter Solstice meal. Despite Jack’s pessimism when I told him I had booked for ten people and the fact that term had ended so a lot of people had gone home, we managed a turn out of eight which isn’t bad at all for an A-Soc social event. While I was at first skeptical when we stepped into the Slug & Lettuce it turned out to be really good. They seated us quite fast once we had insisted that we actually had made a booking and it started to thin out so service wasn’t affected either. The one criticism that could be made was the music was pretty load but it is half a bar so I guess we can let that one slide. The food was excellent, I was quite impressed and everyone else I discussed the issue with was also very impressed with their meal. Being two for one on desserts when you order main meals we made our way through quite a bit of food including some amazing chocolate-puddle puddings. All in all it was a really good night and it was good to have an A-Soc social outside of the pub. Don’t get me wrong, I love the pub visits but it was great to do something a little different and I like to think everyone else enjoyed it too. This entry was posted on Sunday, December 16th, 2007 at 4:21 am and is filed under Humanism, Life. You can follow any responses to this entry through the RSS 2.0 feed. Both comments and pings are currently closed.